The ThinkHub Standard with V552 55" Monitor from NEC is a multi-user NEC collaboration solution powered by ThinkHub. It includes a V552 monitor, 10-point touch overlay, and a hub software installed on Mac Mini. This multi-touch collaboration tool consolidates all the moving pieces of a working session: the screen, devices, applications, ideas, and content. 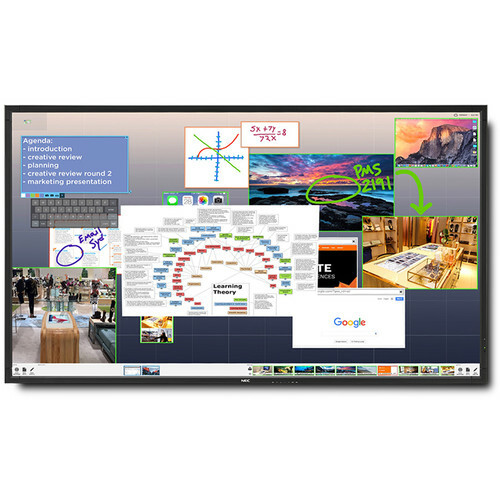 You can access and annotate images, videos, documents, and presentations on the ThinkHub Canvas from a USB, network, or a cloud drive. You can also create notes and sketches, and access web apps and content via the built-in multi-touch web browser. This software-based solution allows you to connect and share an unlimited number of device screens to the ThinkHub Canvas via T1V's AirConnect app. The AirConnect app supports Mac OS, iOS, Windows, Android, and Linux devices, and also allows you to control the device from the ThinkHub Canvas itself via the TouchControl technology. The ThinkHub base works with the already used devices, content, and software, minimizing the set-up time to initiate ThinkHub sessions.